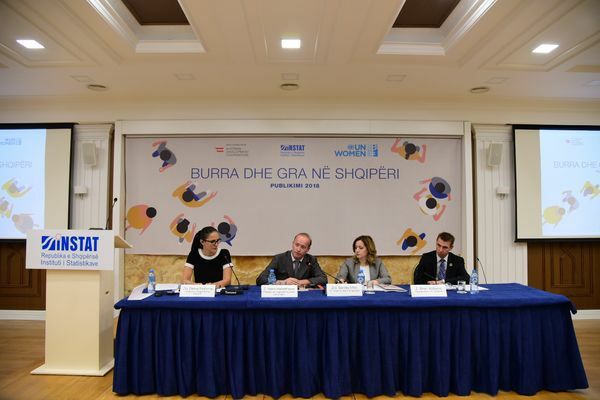 “Women and Men in Albania”, the most recent collection of gender statistics in the country was launched today by the Albanian Institute of Statistics (INSTAT) and UN Women with financial support of the Austrian Development Agency. The publication provides data regarding population, health, education and decision making, bringing into focus gender equality. INSTAT General Director, Mrs. Delina Ibrahimaj, emphasized the importance that this publication has for state institutions, businesses and the population at large. The publication contains important evidence for policymakers and decision-makers working on gender issues and includes an ever-increasing range of gender statistics in Albania. "Of the various innovations, from this publication we can mention the inclusion of domestic movements for men and women in the population chapter, as well as some data on Albanian families with gender analysis," said Ibrahimaj. While, the UN Resident Coordinator in Albania, Mr. Brian Williams, said that UN Women's support to INSTAT over this issue is of particular importance, addressing goal number 5 of the Sustainable Development Goals, the achievement of gender equality and the empowerment of all women and girls. Present at the event, Deputy Prime Minister, Mrs. Senida Mesi, said that the government and her personally are fully committed to advancing gender issues and empowering women's role. She considered this publication as a very important instrument for building appropriate policies and strategies, and serving as a support mechanism for acomplishing international gender equality policies. On the other hand, the Representative of the Austrian Development Agency in Albania, Mr. Heinz Habertheuer, emphasized the increased participation of women in decision-making. According to him, the number of women in the labor market continues to be low, while most women are discouraged to work. Habertheuer said that the lack of a structured childcare service is causing burdens especially for employed women. The publication has examined statistics in the area of decision-making, showing women’s advancment in politics and business, as well as in everyday life. By the end of 2017, women's representation in parliament has reached 29%, and the percentage of women leading enterprises is 30%. Among municipal councilors, women represent 36.9% while their participation in diplomatic missions in 2017 has been comparable to men, where the percentage of women ambassadors was 27.0%, while women in the position of Minister were 57.0%. Focusing on health, Mrs. Ibrahimaj stressed that "these figures should serve policy makers to make better decisions about budget planning in healthcare. As seen from the figures, there is a need to have a gender budget in the country where policies are also focused on the implementation of gender equality in practice." Concerning education, boys dominate in primary and secondary education, while girls dominate in universities by around 60%. Women are half of the population in Albania and consequently they are a very important part of social development. Integrating policies and increasing their access to decision-making or other areas of life should be a priority.